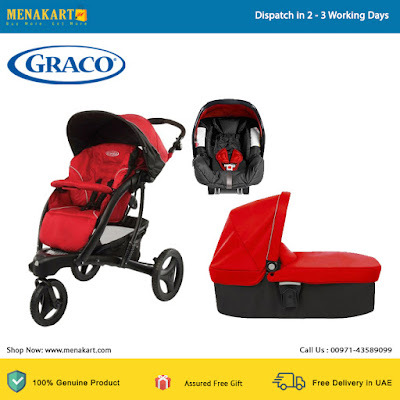 Perfect for taking your little angel for a comfortable ride to the park or mall, the Graco 1808698 Trekko Chilli Baby Stroller is a super cool baby carrying device with fantastic features in a bold red color. This lightweight, Graco baby Trekko 3 wheel stroller can be taken on all your trips or vacations. Its adjustable handle allows ergonomic handling of this stroller for both you and your partner. Anti puncture tires and wheel suspensions ensure maximum reliability and control. The hood of this stroller folds 180 degree, thereby protecting your baby from the sun. Also, providing complete comfort to your child is the multi position reclining seat. The stroller is ideal for infants from birth till they reach up to 23kg. This stroller has all of the must have full size stroller features but in a smaller, more ingenious design.